I want to use this site to share my knowledge about and interest in cable cars (also known as cable tramways). I want to keep it simple. I welcome input from any source, especially about cable cars in cities other than San Francisco. I hope to build this page up gradually as time permits. I welcome information, photographs, and suggestions. Saturday, 11-May-2019 is Cliff Railway Day, 2019. November, 2016 was the 20th anniversary of this website. I wish I had written down the date I started it. Read "It Was 20 Years Ago Today," an article about where I have been and where I am going with the site. The 2018 Muni Heritage Weekend was held on September 8 and 9. The 2018 Cable Car Bell Ringing Contest has been cancelled. I am proud to be the host of gripman Val Lupiz's column: Tales From the Grip. Special Update, December 2011: Maybelle the Cable Car. San Francisco's Transportation Octopus, the Market Street Railway of 1893, a new book by Emiliano Echeverria, Michael Dolgushkin and Walter Rice, is now available as an Ebook on a DVD. I have written a small review. You will enjoy Strephon Taylor's new documentary San Francisco Cable Cars: "At over 140 years old, the San Francisco Cable Cars are a moving monument, a snapshot of nearly lost technology, a romance story, and the very heart of the City." Read about or see some other Cable Car Videos. I can highly recommend Nick Tomizawa's dvd The Feel of the Rope: "a tribute to the men and women that carry on a San Francisco tradition that has continued for over 130 years. Through the words of employees past and present representing two generations of operators, managers, maintainers, trainers, and car builders, you will get an insider's look at what makes the cable cars the most unique transit system in the world." by Robert Callwell & Walter E. Rice, Ph.D. The second edition of Of Cables and Grips: The Cable Cars of San Francisco -- not yet available in a print-and-paper book format -- is available on this web site. Blue and red toy plastic cable cars. They have friction motors on the rear wheels and a bell in the open section. I received them for Christmas, 2018. See more collectible items on my Cable Car Kitsch page. See toys, magazine ads, and other new items. The annual San Francisco History Days at the Old Mint returns on March 01-03, 2019. 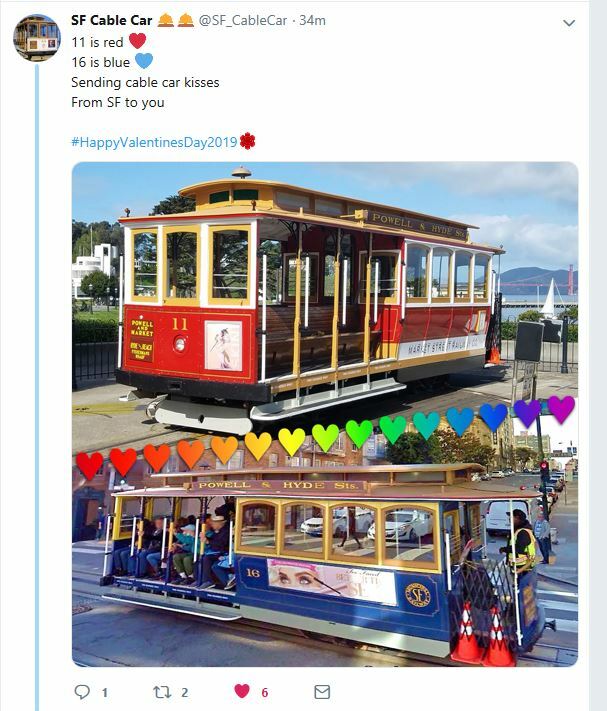 Thank you to @SF Cable Car for sharing this cable car Valentine. There was a storm with high winds on this day. UPDATE: Delay on Hyde btwn Broadway and Pacific has cleared. Hyde Cable Car Line is resuming service. ATTN: Powell Hyde Cable Car Line is blocked btwn Broadway and Pacific by a downed tree. UPDATE: Delay at California and Sansome has cleared. California Cable Car Line is resuming service. ATTN: IB California Cable Car Line delayed at Sansome due to a mechanical issue. ATTN: Due to electrical issue w/ cable motor, Powell-Mason CC Line svc will be provided by bus shuttles today (1/9). ATTN: Cable Cars at the terminals have begun the process of pulling back into the barn. 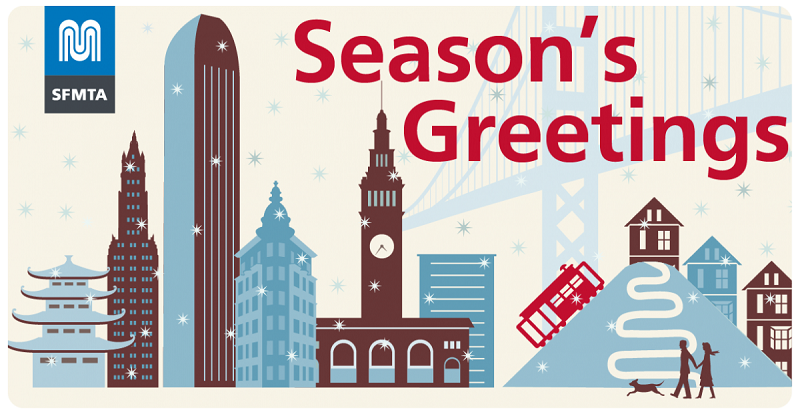 Service on the Cable Cars is provided by buses after approximately 6 p.m.
Holiday greetings and transit information from the San Francisco Municipal Transportation Agency (SFMTA). 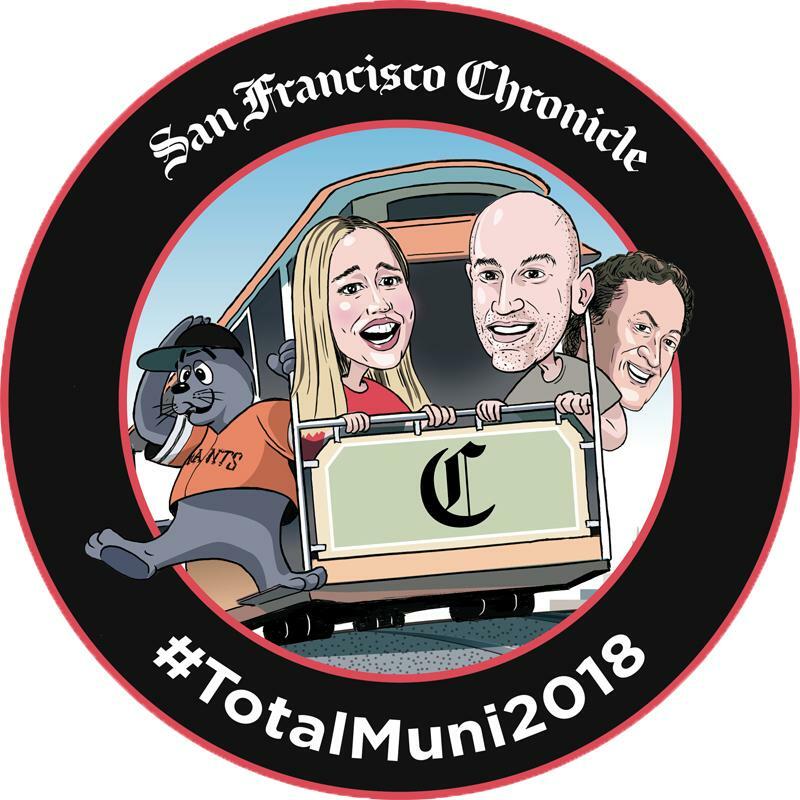 San Francisco Chronicle reporters Heather Knight and Peter Hartlaub, who earlier this year rode every Muni line in one day, interviewed Val Lupiz, Frank Zepeda and Jeremy Whiteman for a podcast. The Bournemouth Borough Council said it did not have the money to repair the East Cliff Lift, so it will remain closed. It was damaged by a landslide on 24-April-2016. The Sutter Street horse car is seen next to two outbound Market Street cable cars. A newly restored version of the 1906 film "A Trip Down Market Street" was projected on the top floors of the new tallest building in San Francisco, the Salesforce Tower on 06- and 07-December-2018. The cable cars were ordered to puill in this afternoon because of unhealthy air quality caused by the Camp Fire in Butte County. The Cable Car Museum at Washington and Mason also closed today. The cable cars returned to service on Tuesday, November 20. The Cal Band was in San Francisco to promote the Big Game. They rode Blue and Gold Car 16. Because of the dangerous level of smoke from the tragic Camp Fire in Butte County, the SFMTA issued masks to cable car crews. As part of the Cable Car Gearbox Rehabilitation Project, the Powell/Mason Cable Car will be temporarily replaced by a free shuttle bus. The shuttle bus will serve stops north of Washington. Transfer between the Powell/Hyde line and the Mason Shuttle Bus at Washington & Powell. In North Beach, the first stop is a temporary stop at Taylor & Francisco. An article in today's San francisco Chronicle says that auditors who rode San Francisco cable cars were not asked to pay 25% of the time. The article did not mention that a conductor's primary responsibility is safety. 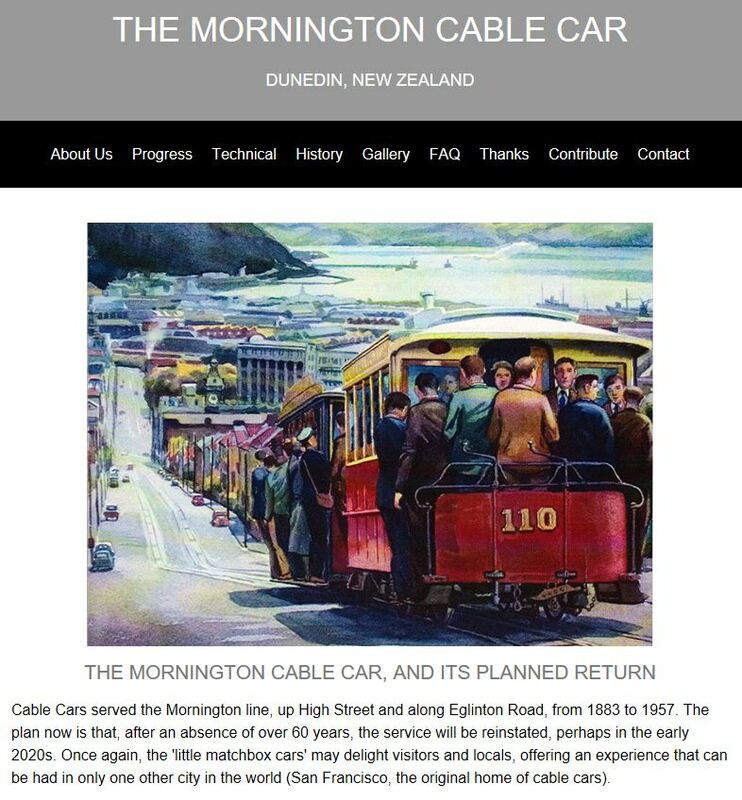 Thanks to Mac Gardner for letting me know about the website of the Dunedin Heritage Light Rail Trust and the High Street Cable Car Society, who are advancing a project with four steps to revive cable traction in Dunedin, New Zealand. Their website rolled out in August, 2018. I am happy that the Dunedin Heritage Light Rail Trust and the High Street Cable Car Society are advancing in the quest to restore part of the Mornington Tramway. Mornington Tramway restored trailer 111 being loaded on to a truck trailer for the trip to Dunedin (source: "Dunedin on the Up With Return of Historic Cable Cars," stuff.co.nz, 07-Jun-2018). The 2018 Cable Car Bell Ringing Contest has been cancelled in part because the people of the Cable Car Division are protesting the SFMTA cutting late night hours on the California Street line. Thank you for your inquiry regarding a date for the next Cable Car Bell Ringing Contest. Unfortunately, we will not have a traditional bell ringing contest this year. Instead, we will be hosting some elements of the bell ringing event as part of Muni Heritage Weekend September 8-9. This event will activate the plaza area at Don Chee Way in front of the Market Street Railway Museum. We hope to return to the traditional event next year. Thanks to Mac Gardner, here is a future view of the temporary museum being built near the former terminal of Dunedin's Mornington Line. It will display two cable trams and a trailer. All rights reserved. July, 2018 Picture of the Month. This is an update of an article originally published in 2016. Thank you to Mac Gardner for providing the information. The Dunedin Heritage Light Rail Trust and the High Street Cable Car Society are advancing a project with four steps to revive cable traction in Dunedin, New Zealand, the first and last city outside of San Francisco to have Hallidie-type cable car lines. Step one is to build an Interim Cable Car Building in Mornington Park. 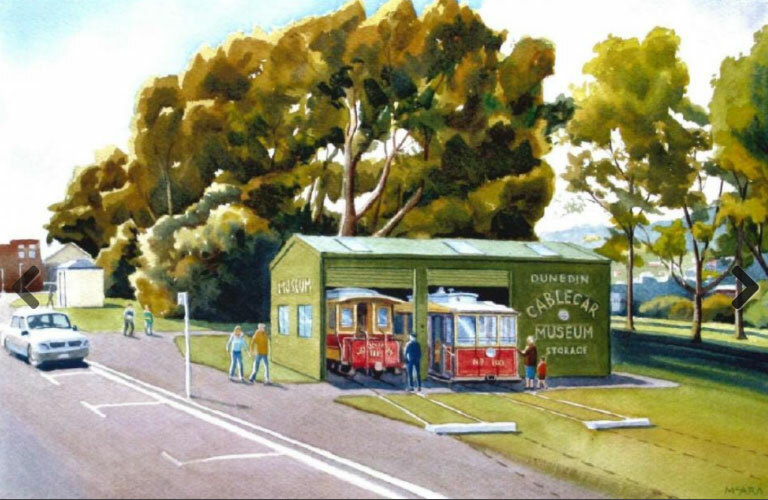 This temporary museum would house two Dunedin cable trams and a trailer, the trailer from the Mornington Tramway and Two trams from the Roslyn Tramway. 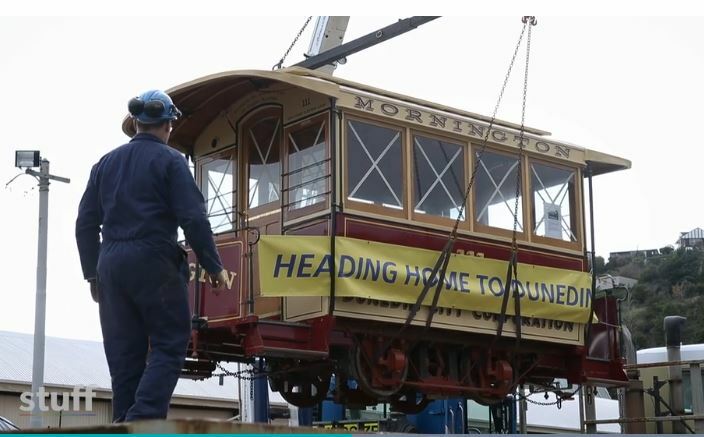 One of the Roslyn trams will be restored onsite. There will be tracks that extend outside so people can view one of the trams and climb on it. 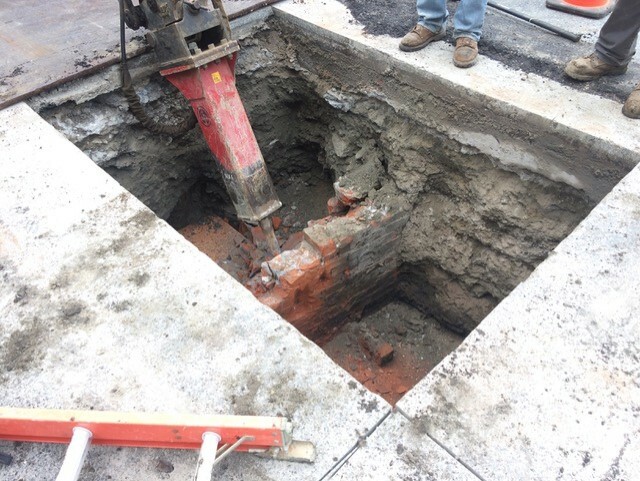 The work started in October, 2017. The remaining steps would build a 1.5km line on the High Street with a terminal and powerhouse in the park. Original cable trams would be used as rolling stock. An article from the 31-October-2016 Otago Daily Times. I wish great success to the Dunedin Heritage Light Rail Trust and the High Street Cable Car Society. Logo Design By John Blanchard / The Chronicle. All rights reserved. Congratulations to Heather Knight and Peter Hartlaub of the San Francisco Chronicle who accomplished the feat of riding every San Francisco Municipal Railway line -- cable car, streetcar and bus -- on one day. They could not ride the 76-Marin Headlands, which only runs on weekends. They started on a 25-Treasure Island at 03:12am. I haven't ridden that bus yet. At 06:00am, with the help of Val Lupiz and Jeremy Whiteman. they rode Powell Street car 24, still decorated to honor Willie Mays and the Giants' 60th year in San Francisco. At the Ferry Building, they met San Francisco Giants CEO Larry Baer, who did had same adventure with a friend in 1980. Giants' mascot Lou Seal was also there. In 18 hours, they rode 60 lines. The Cable Car Cinema and Cafe showed independent and foreign films at 204 South Main Street in Providence, Rhode Island from 1976 to 2018. Today it was announced that the Cinema is closing. It fell victim to the forces that have destroyed so many cinemas across the country. Powell Street car 26 ran for a special charter as 526, its number before 1973. Val Lupiz pulled grip. Powell Street car 11 made its debut after a rebuilding. It is now painted in Market Street Railroad red. Val Lupiz pulled grip. Old Car 28 turns on the motorized turntable in the barn at Washington and Mason before being put away. A California Street car pulls in behind it. Car 28 would retire the next month. December 2003. Photo by Joe Thompson. May, 2018 Picture of the Month. 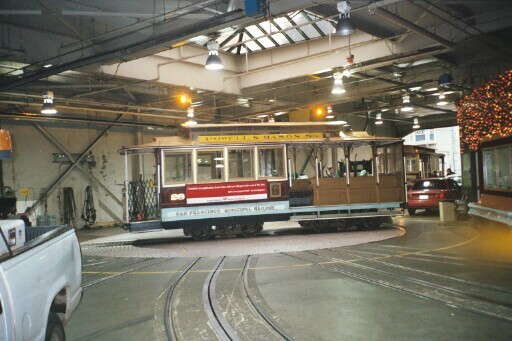 The San Francisco Municipal Transportation Agency will donate former Powell Street car 28 to the Shore Line Trolley Museum in East Haven, Connecticut as part of a deal that brought two electric streetcars to San Francisco. Car 28 was built by Mahony Brothers for the Ferries and Cliff House Railway in 1887. It was an open car until it was rebuilt in 1912. It retired in January, 2004 and was replaced by the current car 28. There had been talk of restoring it to its orignal configuration as an open car. 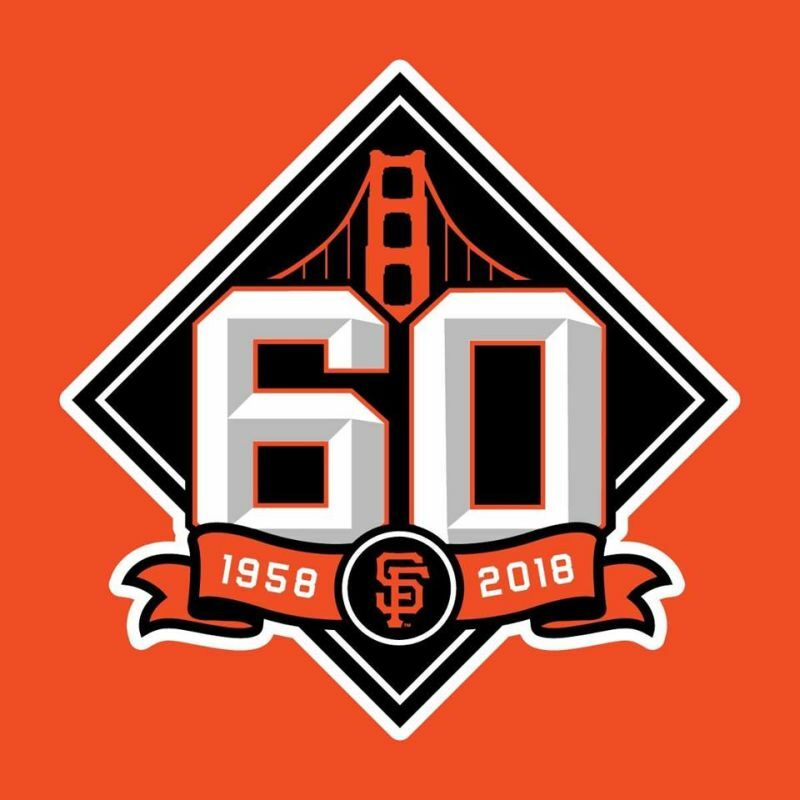 This logo celebrates the Giants' 60th anniversary in San Francisco. Sixty years ago this year, the San Francisco Giants played their first game against the Los Angeles Dodgers at Seals Stadium on 15-April-1958. The Giants moved from Manhattan and the Dodgers from Brooklyn during the offseason. Rub�n G�mez started and beat Don Drysdale 8-0. The Giants are celebrating the anniversary this season. To celebrate the anniversary, Val Lupiz and Jeremy Whiteman decorated Powell Street car 24, which was dedicated to Willie Mays, Number 24, on 06-May-2016. Many vintage streetcars carried flags for the event. I think a child or family fare would be a good idea, along with a transfer that would allow people to visit the museum at Washington and Mason without paying another full fare. The annual San Francisco History Days at the Old Mint returns on March 03-04, 2018. The Western Neighborhoods Project is having an open house between Noon and 4pm to show off its new home at 1617 Balboa Street, between 17th and 18th Avenues. Download the 2017 Isle of Man Horse Tramway Timetable. We all owe a big thanks to the Friends of Douglas Bay Horse Tramway, which has worked hard to keep the line intact. We all have to remain vigilant. Read more about the Douglas Bay Horse Tramway on the Horse Car Home Page. Jan 06 - San Francisco's Market Street Railway assigned sixteen former Howard Street Omnibus cars to McAllister line for the Midwinter Fair. Jan 27 - San Francisco's California Midwinter International Exposition of 1894 opened in Golden Gate Park. Feb 11 - Manhattan's Third Avenue Railroad extended its Third Avenue line. Feb 19 - San Francisco's Market Street Railway extended the Sacramento-Clay line from Walnut Street via Lake and 6th Avenue to D Street (Fulton) Golden Gate Park for the Midwinter Fair. Feb 26 - San Francisco's Market Street Railway extended the Powell-Jackson and Ferries-Jackson lines to Golden Gate Park via the extended Sacramento-Clay line on Sundays and holidays for the Midwinter Fair. May 16 - The Cable Tramway Company of Omaha converted to electric traction. Jul 02 - San Francisco granted Adolph Sutro a franchise for the Sutro Railroad, which would connect Central Avenue with the Cliff House area, breaking the Market Street Railway's monopoly. Jul 04 - San Francisco's California Midwinter International Exposition of 1894 closed with San Francisco Day. Jul 04 - San Francisco's Market Street Railway stopped extending the Powell-Jackson and Ferries-Jackson lines to Golden Gate Park via the extended Sacramento-Clay line on Sundays and hoidays. Sep 19 - A cable tramway begam running between King and Ocean Streets, Sydney, Australia. Dec 04 - A Southern Pacific local train crossing Broadway struck a cable car of the Oakland Cable Railway, killing 22 year old teacher Miss Mae Coates. Dec 06 - Manhattan's Metropolitan Street Railway opened its Columbus Avenue line. New York Giants record: 88-44, 2nd place. Manager: Monte Ward. Jan 09 - The Los Angeles and Mount Washington Railway, a funicular, was abandoned. Jul 01 - The Edinburgh Corporation took over operation of the city's tramways and soon began to convert the cable lines to electric traction. New York Giants record: 71-53, 2nd place. Manager: John McGraw. New York Giants record: 55-98, 8th place. Manager: Mel Ott. Mar 22 - Lynda Johnson, President Lyndon Baines Johnson's daughter, was ordered off a cable car because she was eating an ice cream cone. May 18 - Angels Flight in Los Angeles closed. It returned at a different location in 1996. San Francisco Giants record: 88-74, 2nd place. Manager: Herman Franks. Sep 15 - New Powell car No. 4 was placed into revenue service after a public welcoming ceremony at the Powell and Market turntable. San Francisco Giants record: 103-59, 2nd place. Manager: Dusty Baker. Winning 100 and finishing second made for a frustrating year. Picture of the Month: A conductor and a gripman pose with a Sutter Street Railway train. I like the angle. (Source: OpenSFHistory / wnp27.4669.jpg). Changed toy cable car picture on the main page to blue and red toy plastic cable cars. Archived January 2019 What's New. Picture of the Month: A train of the Los Angeles Cable Railway climbs the steep approach to the Cape Horn viaduct (Source: "The Los Angeles Cable Railway," Scientific American Supplement, 10-October-1891). On the San Francisco Municipal Railway page: Thank you to Andy Donohoe Jr for a 1973 magazine article which includes a photo of his father, conductor Andy Donohoe. "I don't know where I'm going, but let me off when I get there" by Susan Halas, San Francisco Magazine, August, 1973. Picture of the Month: A train of the Temple Street Cable Railway in Los Angeles near Temple and Hoover Streets in 1889. Digitally reproduced by the USC Digital Archive (c) 2004, California Historical Society: TICOT/Pierce, CHS-7070. All rights reserved. On the Roster page: Thank you to retired gripman MJ McClure, some interesting items about the history of Powell Street car 20. Archived November 2018 What's New, 2018 Anniversaries, and July-December 2017 News items. Picture of the Month: Former O'Farrel/Jones/Hyde cable car 59 at Knott's Berry Farm. Fitted with electric motors on its trucks, it served as a parking lot tram from about 1955 to about 1979. The Lorings to Resign (San Francisco Morning Call, Tuesday, May 29, 1894). "They have been connected with the roads (cable and electric - JT) since the cable was built and are perfectly conversant with every detail of the business. It is rumored that their resignations were requested." Martin Succeeds Lorings (San Francisco Morning Call, Friday, June 1, 1894). "Mr. Martin of San Francisco, an experienced railroad man, will succeed the Lorings..."
Cable Car Struck by Steam Train -- a series of articles about a fatal accident in December, 1894. Battle Over Assessments (San Francisco Morning Call, Thursday, July 15, 1897). Southern Pacific's attorney battled to get assessments reduced: "2.35 miles of cable on San Pablo avenue, from $83,225 to $47,000; franchise on the same, from $71,000 to $10,000; .35 of a mile of cable-road near Park avenue, from 11,750 to $3500..."
Only Broad Tracks Now/The Unpopular Narrow Gauge Torn Up (San Francisco Morning Call, Sunday, September 4, 1898). An article about the beginning of the process to convert the former South Pacific Coast line to standard gauge mentions that "The railroad company has also contracted for the material for changing the San Pablo cable road into an electric system, the contract being contingent on the permission of the City Council to make the change." Changed toy cable car picture on the main page to a front-end view of Number 512. Picture of the Month: Oakland Cable Railway car. Add thanks/links to cable car email list and Railway Preservation News. Add links to The American Heritage Time Machine and The Engines of Our Ingenuity. Picture of the Month: Los Angeles Cable Railway Cape Horn viaduct. 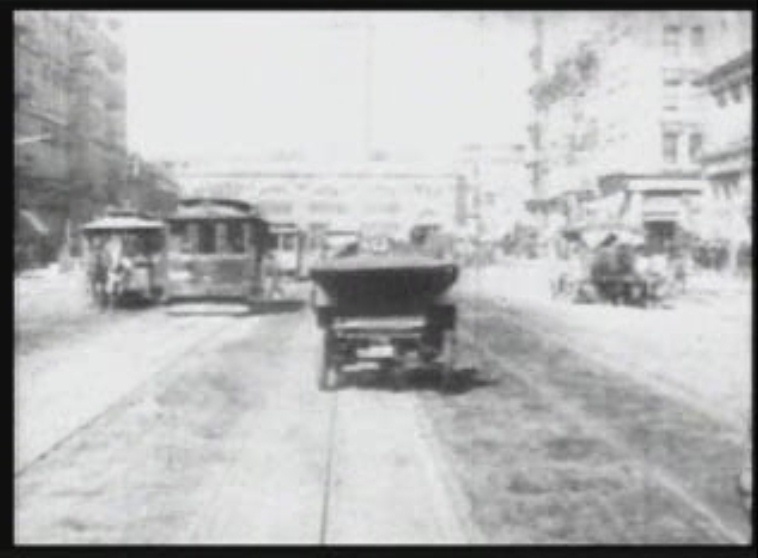 Picture of the Month: Los Angeles Temple Street Cable Railway cable train. Note: Guestbook entries will not appear online until I have reviewed and approved them. The amount of text available is limited, so please keep your entry brief. The opinions expressed in The Cable Car Home Page are mine. All copyrights and trademarks belong to the people or firms that own them. I have always tried to give credit where credit is due. If I have failed and you can correct me, please let me know immediately. In such cases, I apologize beforehand and I mean no harm. In general, the contents of The Cable Car Home Page (unless otherwise noted) are the copyright of Joe Thompson. Following the links on this site may cause you to leave the Cable Car Home Page and enter the website of a third party. I have no influence whatsoever over the design and content of such websites and can accept absolutely no responsibility for them. This page has been referenced times since 01-March-2015. Copyright 1996-2019 by Joe Thompson. All rights reserved.